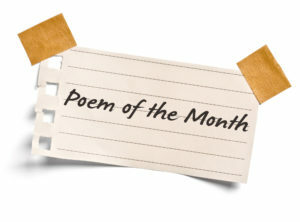 Poem of the Day, April 27: Confronting Clutter, Carolyn Koehnline | Welcome to the new Journalverse! 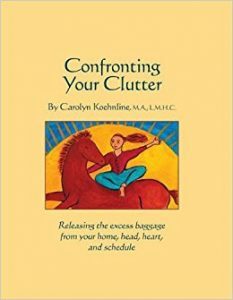 Confronting Your Clutter is a collection of essays, poems, and exercises designed to decrease shame, increase inspiration, and get you unstuck. This book gently invites you to take a closer look at clutter, prepare for change, gather support, get out of your own way, learn to let go, and find new ways to navigate time. Carolyn Koehnline, M.A., is a Licensed Mental Health Counselor in private practice. She has been offering psychotherapy and clutter assistance classes, and seminars since 1992. Carolyn teaches a wide variety of workshops through Whatcom Community College. She is also a Certified Journal to the Self Instructor and core faculty at the Therapeutic Writing Institute. She regularly offers private classes teaching dynamic journal techniques. She lives in Bellingham WA with her wife, Dominique. That’s what the books all say. and deal with it once and for all. objects skulking around with no real home. feelings I don’t want to feel. If you call this simple, you are setting me up for failure. Write about your relationship with clutter–whether “the stuff” is physical, emotional, mental, spiritual. Write a poem expressing your desires and fears with regard to confronting clutter.